Rotorua swimmer Paddy Baylis has cemented a season to remember with his selection in the New Zealand team to compete at the 2018 Junior Pan Pacific Swimming Championships. The championships are being held from August 23-27 in Fiji. At the Swimming New Zealand Open Championships last week, Baylis gave it everything in the 800m freestyle to achieve a best time of 8m 28.49s and claim the bronze medal. It was his first medal at an open national event, which reflects his growing stature as one of the best distance swimmers in New Zealand. Unfortunately, his exertions aggravated a pelvic injury suffered racing at the Oceania Championships the week before. However, the Pan Pacific selectors were confident that he would have made the qualifying time, and still named him to join a strong team of 18 swimmers and four coaches. 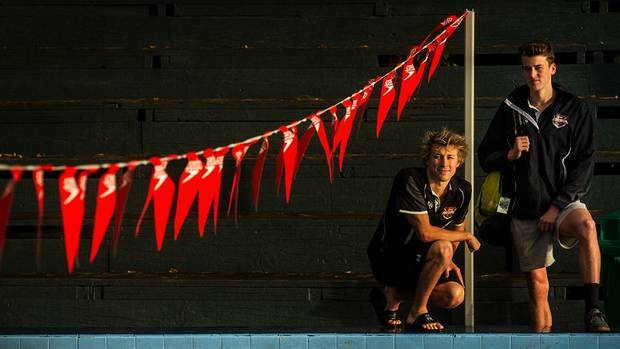 Swim Rotorua head coach Alastair Johnson was delighted for Baylis. "He has trained really hard for many months and has made a lot of progress this year. Unfortunately, Paddy has picked up this pelvic injury which affected his performances. "We now have six weeks to get him mended and to get him in peak condition for Junior Pan Pacs where he will be racing against the best swimmers from the USA, Australia, Japan, Canada and China," Johnson said. Meanwhile, six swimmers competed at the Greerton Winter Meet held at the weekend. Despite racing in the middle of the training cycle, the Swim Rotorua team posted plenty of best times. James Baldwin, 16, was first in the 50m freestyle with a time of 25.06s. In his last race, James showed great determination on the last lap to hold on and take third sport with another encouraging time of 55.59s. His other top 10 places came in the 100m medley (6th), 50m breaststroke (5th), 200m freestyle (6th), 50m backstroke (6th) and 50m butterfly (5th). Annelyse Cowie produced three great efforts in her favourite breaststroke events to take home a trio of third spots in the 13-14 years age group. She posted personal bests in the 50m and 100m events in times of 36.78s and 1m 19.18s respectively. Annelyse's other top 10 placings came in the 400m freestyle (7th) and in the 100m butterfly (5th). Theo Harvey, 13, impressed with best times achieved in all his seven events. He completed the 400m freestyle in 4m 39.23s to take second place. He produced encouraging results in his other freestyle events, the 200m (4th), 100m (7th) and 50m (10th) races. His other top 10 spots came in the butterfly events where he was fifth in the 50m, fifth in the 100m, and seventh in the 200m. Rocco Marsh is showing steady improvement and developing his range of events. His top performance came in the 16 years and older 50m freestyle when he finished third with another best time. He was fourth in the 50m backstroke and 100m freestyle. Other top 10 placings came in the 100m medley (5th), 100m backstroke (5th) and 50m butterfly (9th). Lina Stahlhut impressed in her 800m freestyle race to take third place in the girls' 13 years and younger age group. Her time of 9m 48.97s was another big improvement. In her other events, Lina placed fifth in the 400m freestyle and eighth in the 200m medley. Emily Spear, 15, held strong to deliver best times in the 200m freestyle, 200m butterfly and 200m breaststroke. Her other top 10 places came in the 800m freestyle (sixth), 100m breaststroke (sixth), and 100m butterfly (seventh). Johnson was pleased with the team effort. "It has been a useful hit out for the swimmers. Despite being mid cycle and not quite at full speed in training, the swimmers have shown some really good race skills and resolve to carve out plenty of encouraging performances," he said.